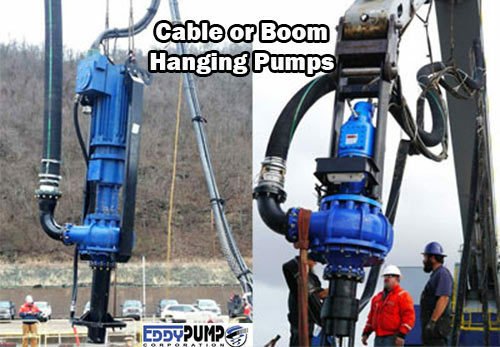 The EDDY Pump can be deployed in various dredge configurations to optimize the loading or unloading of a barge. Some of the ideal deployments for offloading are the Excavator Pump Attachments, and Cable-Deployed Pumps. This is dependent on the job site and applicable setup (crane, fixed boom arm, excavator, etc). 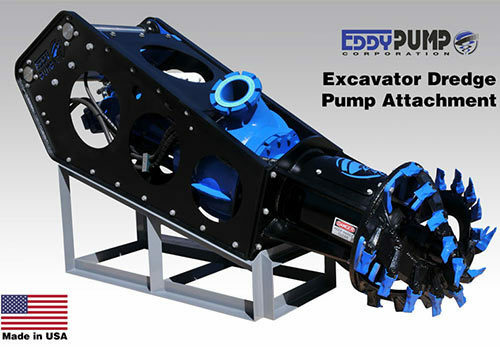 The EDDY Pump Excavator Dredge Pump Attachment is one of our most popular units. It allows any power generation or contracting company with little or no experience in dredging to easily convert one of their existing excavators or a rental into a hydraulic dredger. An excavator operator can then easily learn to operate the Excavator Pump Attachment with only a few hours of training. The Excavator Pump gets pinned to the end of the excavator boom and can either be used with a cutterhead or a liner safe rolling attachment. The jetting ring pictured has been replaced with the improved version below. They attach the same way. The following water jetting ring can be attached to a 6-inch through 10-inch dredge pumps. This unit was designed and fabricated by EDDY Pump. There are 28 jet nozzles that can be capped or left open to best address the needs of your project. Shoot water straight down to break up material, or at an angle to clean a barge during unloading. Attache to an EDDY Pump or purchase as a stand-alone unit. Call us for details. “New Water Jet Jetting Ring” Used to help fluidize and break up material. Adjust jets to as many or few as needed. Also adjust direction to match your application. This ring can attach to a hanging unit deployed off a platform, in an A-frame setup. It can also be attached to an excavator attachment for use instead of a cutter head. Customer feedback has been great. An additional jetting unit specifically for high pressure cutting and material breakup is rolling out 2018. Call for details. The purpose of this page is to identify your application and learn more about an equipment solution to meet your needs. These are the most common barge transport applications that we work with. We are the OEM for the tools shown. Application: Transport and pump material out of or into barges and rail cars. Material: Slurry, wet grains, bottom material from environmental cleanup or any material with a wet format. This barge unloading dredger is Not for dry material transport. The EDDY Pump Excavator Attachment is ideal for pumping slurry from barges, rail cars, pits, lined ponds or other bodies used for material storage. Optional upgrade: Add liner-safe rollers, as it also gives you the ability to dredge on concrete lined sumps or poly-lined reservoirs without disturbing the liner. Below are common pumping distances we see, along with a pump curve to match the details. Contact us with your exact numbers. Photos of recent barge unloading pumping projects. With the water jetting ring a dry material can be liquidized or broken up for pumping. A new jetting ring will be introduced in 2018 to add another option for projects.